Marie K. Holowaychuk, DVM, DACVECC, is a locum criticalist and speaker for Critical Care Vet Consulting and assistant editor for the Journal of Veterinary Emergency and Critical Care. She earned her DVM from Western College and completed a year-long rotating internship at Washington State University, followed by a 3-year small animal emergency and critical care medicine residency at North Carolina State University. She was previously assistant professor of emergency and critical care medicine at Ontario Veterinary College. Hope, a previously healthy 3-year-old spayed pug, was presented on a hot afternoon in August after an episode of collapse. The owners had previously taken Hope to the park and noticed she was panting excessively and became lethargic after 45 minutes. They offered her water, which she drank readily, and immediately brought her to the clinic. Hope was up-to-date on vaccinations and had been receiving monthly parasite preventives. At presentation, Hope was panting, had stertorous breathing, and was tachycardic (160 bpm). Physical examination showed bright red mucous membranes; capillary refill time was <1 second. Rectal temperature was 105.4F (40.8C), and oscillometric blood pressure was 100/60 mm Hg with a mean arterial pressure of 73 mm Hg. During examination, Hope vomited water. A small amount of blood-tinged stool was noted on the rectal thermometer. Laboratory tests performed on admission are shown in Table 1. Which of these is the most appropriate initial treatment that should begin immediately in a patient with suspected heatstroke? Related Article: Polling Place: The Febrile Patient: Should You Cool It? External cooling should be implemented by owners whenever heatstroke is suspected, even before the dog is brought to the hospital. Owners can spray the dog with lukewarm (tepid) water, offer water to the dog, and drive to the clinic with the windows rolled down or the air conditioning turned on. Advising owners about the risk for heatstroke during warmer months is key to preventing this serious and sometimes fatal disease. During acclimation periods to hot and/or humid weather, dogs should not be permitted to run or play outside. Dogs should never be left in cars on hot days for any amount of time. If signs of heatstroke are present, the dog should be immediately cooled and taken to a veterinarian for assessment. Figure 1. 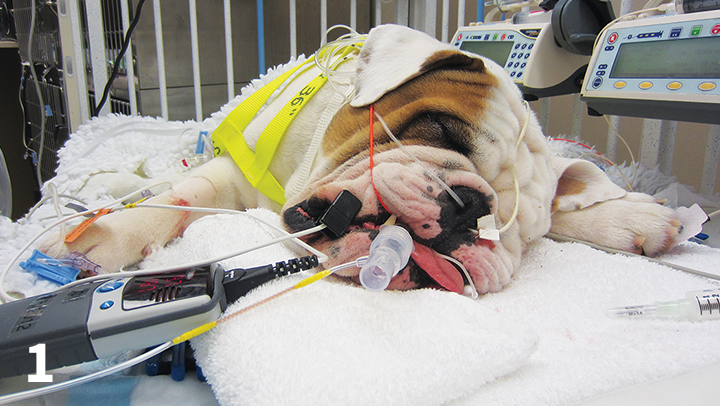 A bulldog with brachycephalic obstructive airway syndrome is endotracheally intubated shortly after admission on a hot day. The dog was diagnosed with severe heatstroke. On patient arrival, ensure the dogs airway is patent, particularly if there is history of laryngeal paralysis or brachycephalic obstructive airway syndrome. Heatstroke can be exacerbated by upper airway obstruction, and dogs that are having difficulty breathing might require rapid intubation (Figure 1). Oxygen therapy (eg, flow-by, mask) can be initiated while an IV catheter is placed and initial laboratory work is performed. Ideally, blood and urine should be collected to obtain baseline values via CBC, serum chemistry profile, clotting times, and urinalysis. Figure 2. 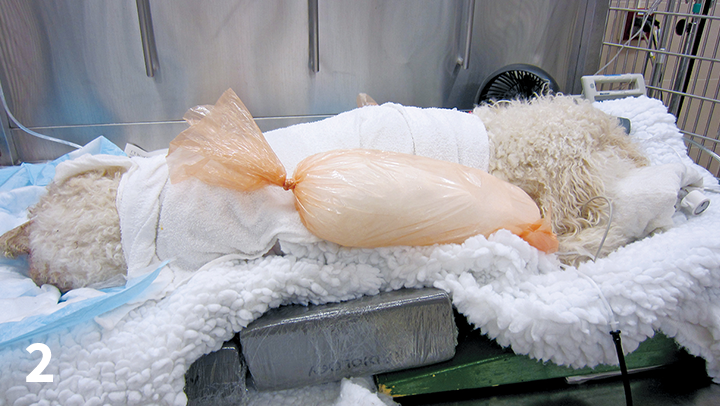 Plastic palpation sleeves filled with ice chips are placed around a dog with heatstroke to enhance external cooling. Dogs should be actively cooled to a rectal temperature of 103.5F (39.7C).2 If the owner has not already achieved this with external cooling methods, this can usually be accomplished by spraying the dog with lukewarm water, draping a cold and/or wet towel over the dog, and placing a fan in front of the dog. Ice packs or rectal palpation sleeves containing ice slush can also be placed in the inguinal, axillary, and neck regions (over the large central vessels; Figure 2), but should be removed if shivering occurs or after 20 minutes to avoid peripheral vasoconstriction. Heatstroke is an acute, progressive, life-threatening emergency characterized by an increase in body temperature that results in direct thermal injury to organs. Heatstroke occurs secondary to exposure to high environmental temperatures (ie, classic heatstroke) or strenuous exercise (ie, exertional heatstroke). 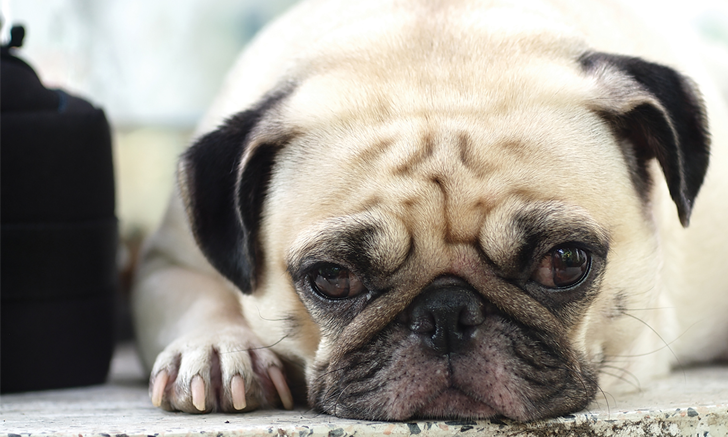 Dogs that are especially prone to heatstroke include those with laryngeal paralysis, brachycephalic obstructive airway syndrome, obesity, and/or cardiovascular disease, as are older dogs or those with a dark or dense hair coat. Ice water baths are poorly tolerated and make patient monitoring difficult; therefore, they are not recommended. NSAIDs should also be avoided because of the risk for GI complications and kidney injury. Corticosteroids have no proven benefit and are contraindicated. Isotonic crystalloids (eg, Plasmalyte A, Lactated Ringer solution) should be administered in 20 mL/kg bolus volumes over 15 minutes until signs of hypovolemia (eg, hypotension, poor pulses, prolonged capillary refill time) have resolved. In severe cases of heatstroke, treatment is intensive and can include GI protectants, fresh frozen plasma, supplemental oxygen, dextrose supplementation, anti-arrhythmic medications, mannitol, and/or broad-spectrum antibiotics if sepsis is suspected. The mainstays of therapy for heatstroke patients include rapid cooling, volume replacement to optimize perfusion, and management of secondary complications. Bruchim Y, Klement E, Saragusty J, Finkeilstein E, Kass P, Aroch I. Heat stroke in dogs: a retrospective study of 54 cases (1999-2004) and analysis of risk factors for death. JVIM. 2006;20(1):38-46. Hemmelgarn C, Gannon K. Heatstroke: clinical signs, diagnosis, treatment and prognosis. Compend Contin Educ Vet. 2013:35(7):E3. Hemmelgarn C, Gannon K. Heatstroke: thermoregulation, pathophysiology, and predisposing factors. Compend Contin Educ Vet. 2013;35(7):E4. Bruchim Y, Loeb E, Saragusty J, Aroch I. Pathological findings in dogs with fatal heatstroke. J Comp Pathol. 2009;140(2-3):97-104. Aroch I, Segev G, Loeb E, Bruchim Y. Peripheral nucleated red blood cells as a prognostic indicator in heatstroke in dogs. JVIM. 2009;23(3):544-551. Johnson SI, McMichael M, White G.Heatstroke in small animal medicine: a clinical practice review. JVECC. 2006;16(2):112-119.